Art and fashion, intrinsically linked and more so than ever. From clothing design to catwalk show art direction, major labels to boutique houses, the word of fashion is falling over itself to involve important names from a diverse range of the visual arts. It’s hardy surprising — after all what is fashion if not wearable art — and these collaborations between the disciplines are certainly mutually beneficial. Fashion, often unfairly judged as one of the more frivolous applied arts, gains serious cachet by association, while the artist reaches a wider, more populist audience. If the collaboration between fashion and art is currently at a peak, it’s by no means a new phenomenon. 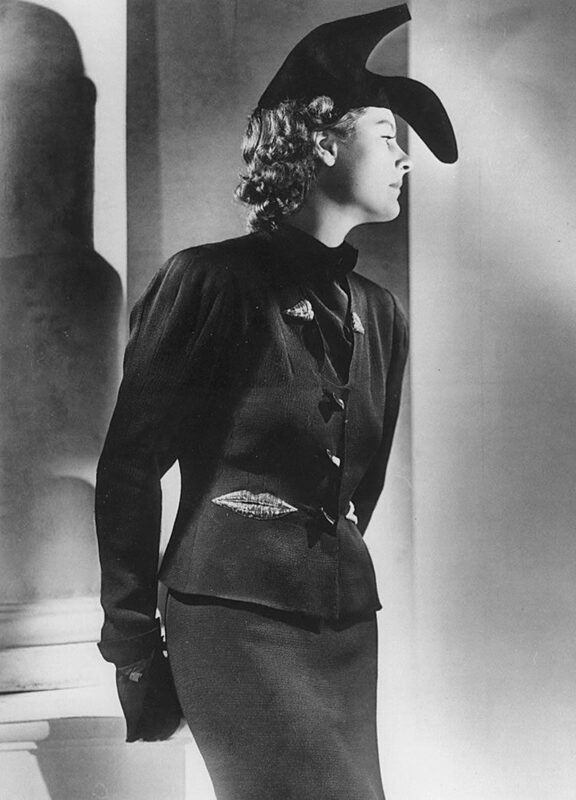 Elsa Schiaparelli was one of the most imaginative and prominent fashion figures working between the two world wars. Her whimsical nature was perfectly suited to the genius of Salvador Dalí who inspired some of her best-known works. 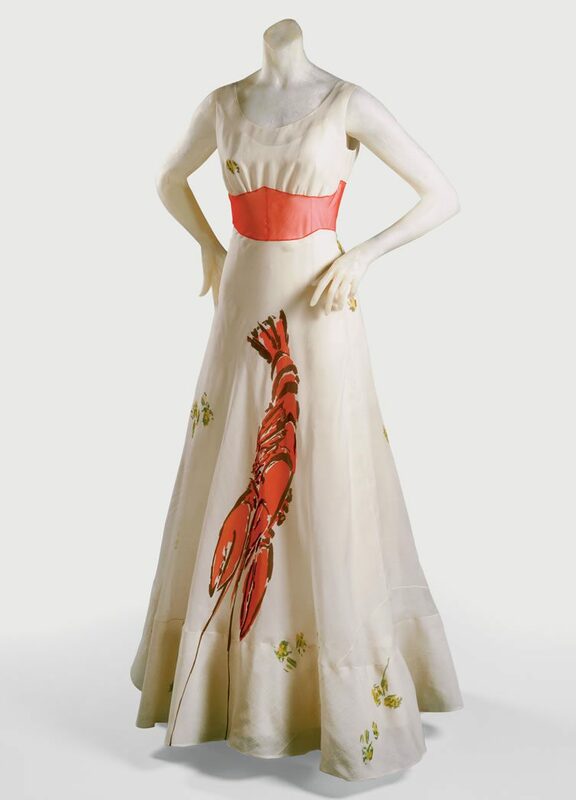 It could only have been the meeting of such minds that would create pieces such as the 1937 Lobster dress. The simple white silk piece featured a giant lobster painted by Dalí and was a playful homage to his 1934 creation New York Dream-Man Finds Lobster in Place of Phone. Equally celebrated in Schiaparelli’s impressive catalogue is the wonderfully surreal Shoe Hat, made by Schiaparelli and designed by Dalí. The hat, fashioned into a woman’s high-heeled shoe, was modelled by Dalí’s wife Gala, and featured in Schiaparelli’s Fall-Winter 1937-38 collection. 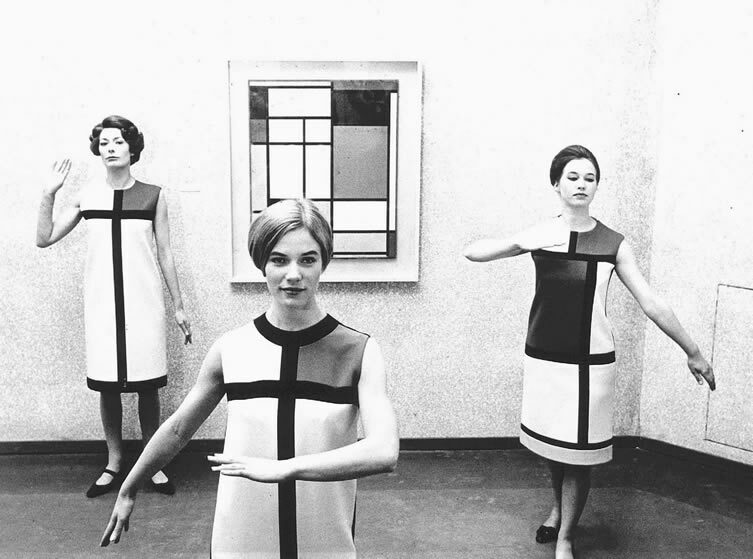 Another early example of the fashion-art crossover stemmed from the bold geometry of Dutch painter Piet Mondrian, whose “neoplasticism” style was itself informed by cubism. In the 1930s, Hermès designer Lola Prusac looked to Mondrian’s famous works — featuring white backgrounds, grids of thick black lines and blocks of primary colours — for inspiration, producing a range of luggage and bags with square inlays of red, yellow and blue leather. Mondrian’s work continued to exert a powerful influence on fashion long after his death in 1944. Legendary French designer Yves Saint Laurent enjoyed one of his most important successes when, in 1965, he unveiled his Fall Mondrian Collection. Although other designers had previously experimented with a similar design, it was Saint Lauren’s six A-line cocktail dresses that really captured the public’s imagination and broke new ground for the future role of art in fashion. 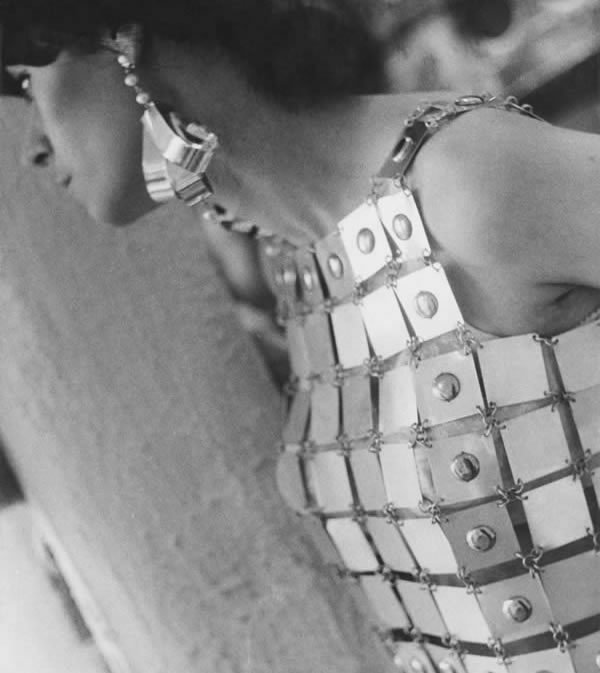 Building some of the most iconic architecturally-inspired clothing has to be couturier Paco Rabanne. His first runway show in 1966 was titled 12 Unwearable Dresses in Contemporary Materials and featured pieces made out of sheet metal and rubber. Despite the unconventional materials, Rabanne skilfully structured his dresses to his models’ exact proportions. Perhaps this is because Rabanne always had his mother’s advice in the back of his head: “In fashion you have every liberty except one, don’t ever undermine a woman’s beauty.” Rabanne was certainly true to these words, no matter what materials he was using. 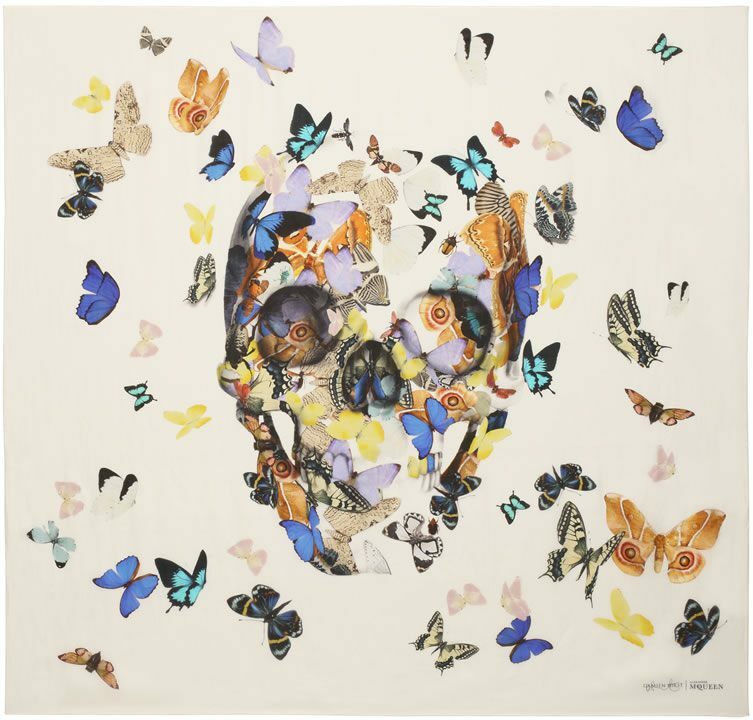 The amalgamation of art and fashion is so successful that Alexander McQueen’s team decided to announce an exclusive collaboration with Damien Hirst in 2013. The work reflects a meeting of two of the darkest minds in contemporary design. Ethereal and haunting, McQueen takes inspiration from Hirst’s Entomology series. Butterflies, spiders and other insects crawl across McQueen’s collection of 30 chiffon scarfs, forming geometric patterns across the fabric. This collaboration was celebrated equally across both the art and fashion world, suggesting an interdependence that will long continue. Looking at big name designers today, it’s clear they are continuing to follow suit by moulding all manner of art and design into their collections. Fashion’s favourite sisters, Kate and Laura Mulleavy, who have worked with high-street giants such as Gap and Target, are among those who have turned to the artistic canon for inspiration. 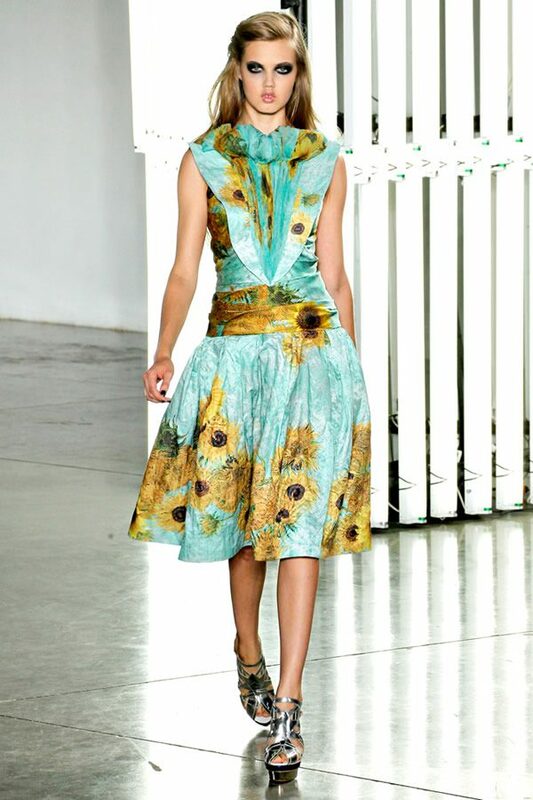 The sisters were celebrated for incorporating Vincent Van Gogh’s work in Rodarte’s 2012 collection, from subtle references to the impressionist painter’s thick brush strokes within their light fabrics and colour palette, to their bold tribute to Van Gogh’s Sunflowers in their iconic flower print chiffon dress. But leave it to Marc Jacobs to take artistic inspiration to the next level. Unsurprisingly the conceptual artist Daniel Buren described their 2013 Louis Vuitton collaboration as a “totally crazy experience”. 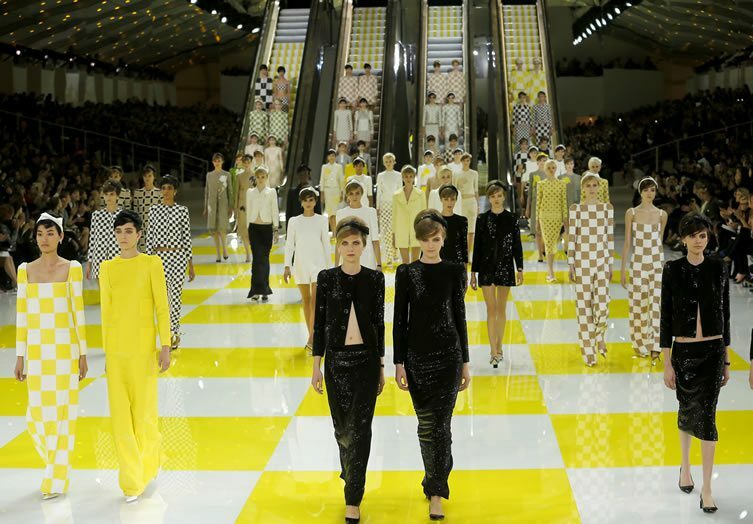 Not content with incorporating Buren’s check canvas designs into his clothes, Jacobs drafted the artist in to design the staging for his catwalk show. Buren had complete artistic freedom when designing his monolithic set, complete with moving escalators. The breathtaking spectacle was installed in the central courtyard of the Louvre, creating an unforgettable collaboration of art and fashion. We’ve seen how readily fashion has embraced the ideas of art, from the historical absorption of influences to the present day in which fashion collections are conceived and marketed using, and in part creating, the new-found celebrity of artists. But if the relationship is a two-way street, what of the art world’s engagement with fashion? Here too we find significant collaborations which challenge the notion of any perceived snobbery on the part of art towards fashion. 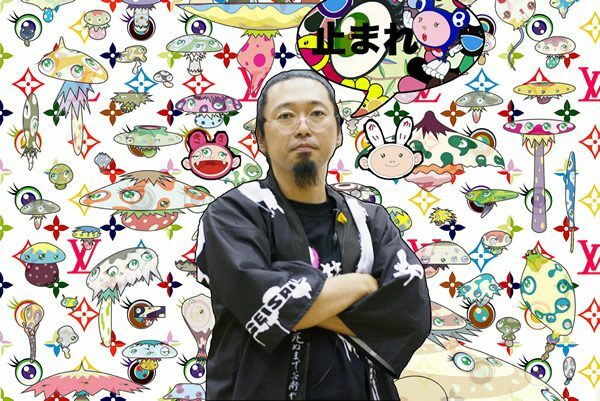 Japanese contemporary artist Takashi Murakami can rightly be considered a pioneer of multi-disciplinary crossovers, working in both the fine art fields of painting and sculpture while at the same time enjoying success in the areas of animation and merchandise. His holistic, commercially-savvy approach makes fashion a natural arena for Murakami to express himself, and the artist recognised early in his career how increased exposure from mainstream collaborations could develop his overall practice. It was that man Marc Jacobs again who got the ball rolling for Murakami, inviting him to work on a now-famous range of handbags for Luis Vuitton which re-invented the company’s signature LV emblem. Following the huge success of the project, Murakami has struck up a long-lasting creative partnership with the brand, and enjoyed further commercial and critical success with the likes of shoemaker Vans. 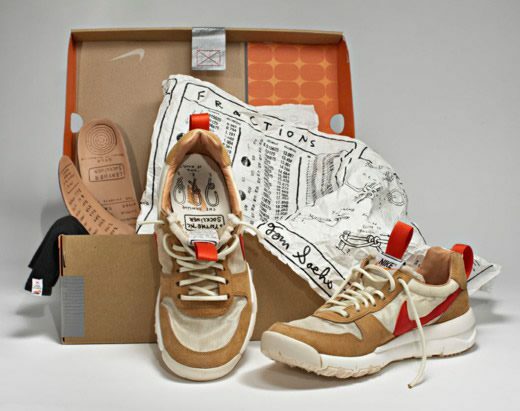 On the topic of footwear, no discussion of the art-fashion symbiosis can pass without considering Tom Sachs and his work with sports mega-brand Nike. 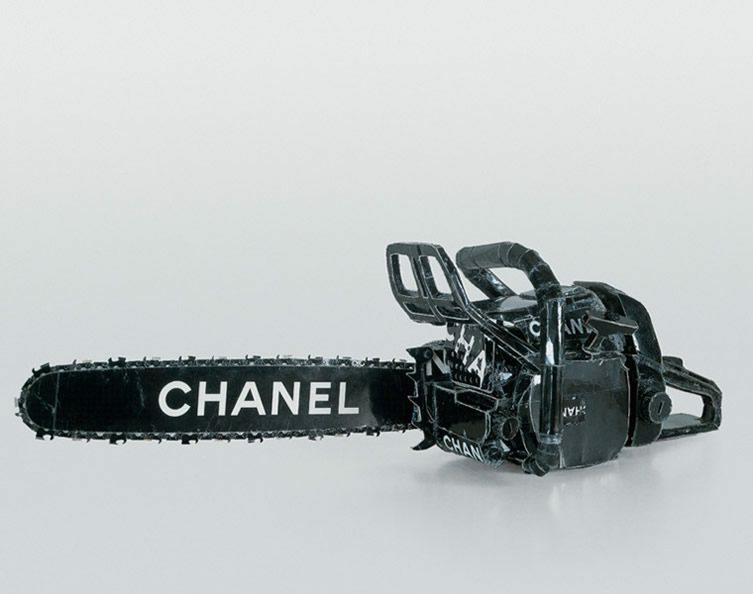 The American sculptor has something of a love-hate relationship with fashion and commercialism in general, having produced several high-profile works critiquing the fundamental ideas of luxury brands such as Chanel. However, the more accessible field of sportswear gave Sachs a platform to explore issues of mass-production, economy of scale and environmental impact. The artist’s NIKEcraft collaboration centred around an imaginary, lo-fi mission to Mars, and pushed the boundaries of materiality by repurposing car airbags, boats’ sails and even an actual spacesuit to construct his near-future designs. Contemporary artist Vanessa Beecroft has long incorporated fashion into her multi-disciplinary practice, with the Italian’s performance pieces making extensive use of models in haute couture loaned from big name labels. This interest in the performance aspect of fashion has led to some notable collaborations, especially centred around live shows and the theatricality of the catwalk. When Kanye West launched his Adidas collection earlier this year, it was Beecroft’s influence that made the show stand out; referencing her 2005 performance work VB55, the models didn’t parade up and down a catwalk at all, instead occupying a space in unmoving, hypnotised ranks as they wore a collection of utlitarian, quasi-military urban casualwear. Finally, we wind the clock back to the ever-innovative master of multi-displinary art, Andy Warhol. The Pop Art genius had a long-standing fascination with fashion dating back long before the days of fame and The Factory. Warhol had started out in fashion illustration, working for glossy magazines designing for advertisements for products such as Schiaparelli’s gloves. 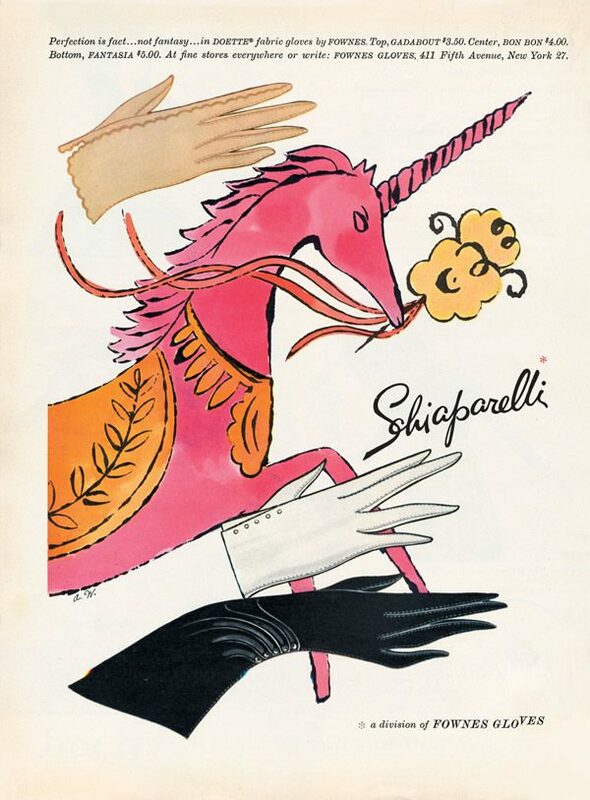 Advertisement by Andy Warhol for Schiaparelli gloves. Printed ink on paper. 12 3/4 x 9 1/4 in. (32.4 x 23.5 cm.) The Andy Warhol Museum, Pittsburgh; Founding Collection, Contribution The Andy Warhol Foundation for the Visual Arts, Inc.
His breakout artwork, the infamous Campbell’s soup cans, quickly crossed over from wall art to wearables, with New York society girls among the first to wear dresses printed with can designs in response to his show (Campbell’s themselves later produced a paper version of the dress for the princely sum of $1 and two cans of soup). 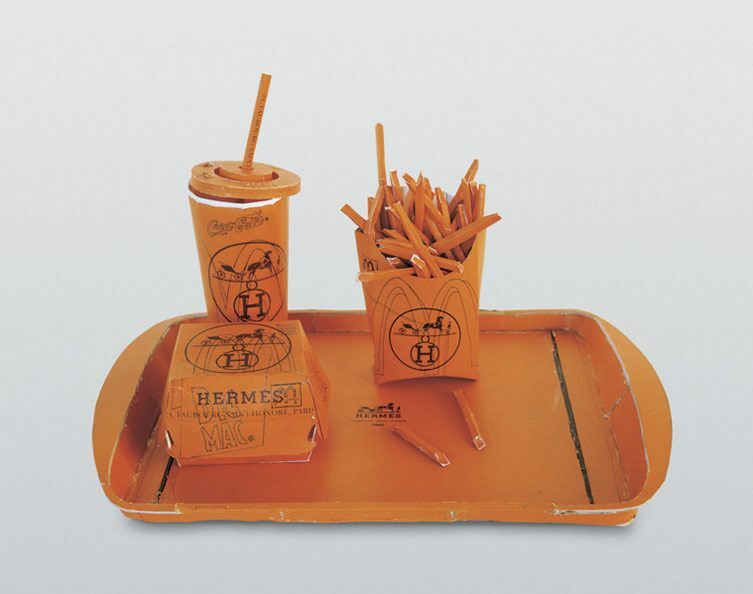 Once an employee of tastemakers such as Harper’s Bazaar, Warhol became a tastemaker himself. He launched his own magazine, Interview, in which fashion figures — designers, models, and fashionistas alike — played a starring role, and there was never a demarcation between his professional and personal relationship with fashion. 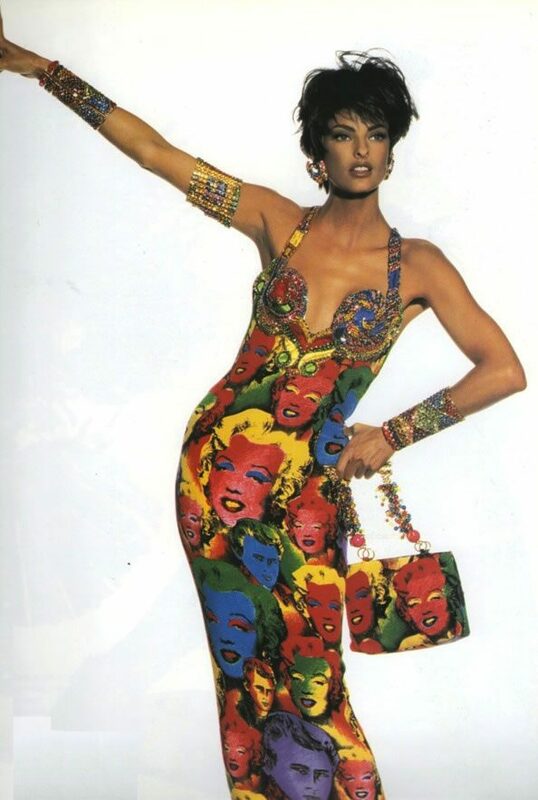 Posthumously, Warhol’s position in the fashion Hall of Fame was cemented by Gianni Versace‘s 1991 Pop Art collection, which included a jewel-encrusted version of the artist’s lurid Marilyn Monroe prints. It may be true that for every meaningful collaboration between art and fashion, there are ten creatively empty exercises in marketing. Putting cynicism aside, however, and there’s no disputing the symbiotic relationship that has always existed between the two – a relationship which only looks to be growing stronger as more of the contemporary art world’s top talents step over into the glamorous world of fashion.